The mission statement of First Baptist Church states, “As a community of faith, we share the love of Christ through missions and ministry.” First Baptist offers opportunities for worship, fellowship, missions and ministry all of which are designed to proclaim the love of Christ. The church is large enough to offer a variety of programs for all ages, from preschoolers to senior adults, for spiritual growth, and hands on mission endeavors. At the same time you will never feel “lost in the crowd” because the church membership is friendly, engaging, and receptive. Founded in 1874, First Baptist Church of Graham is a part of the Cooperative Baptist Fellowship (national) and the Cooperative Baptist Fellowship of North Carolina. FBC also is a part of the Mt. Zion Baptist Association. The church financially supports North Carolina Baptist Men and Women’s Missionary Union of North Carolina as well as Allied Churches of Alamance County. From the very beginning, First Baptist Church of Graham, has been a mission- oriented church. According to written records, on Saturday, June 20, 1874, Rev. W T Farrow, missionary of the Mount Zion Association, along with seven members of the Baptist faith “living in or near the town of Graham” met in the Alamance County courthouse to organize a Baptist Church in Graham. The articles of faith and covenant were adopted, and the church was officially organized and named “The Graham Baptist Church.” Through their foresight, faith in God, and spiritual inspiration, Graham Baptist Church began with the purchase of a lot for one dollar to John R Pugh and James A Graham, trustees of Graham Baptist Church. This purchase by the seven charter members not only impacted the city of Graham, but has impacted Alamance County, North Carolina, and the world, as well. To see God’s hand in this endeavor, the next afternoon a gift of a half-acre lot was given to Graham Baptist Church from the Alamance County commissioners and a committee was appointed to “solicit subscriptions for the erection of a house of worship.” In September 1874, the Mount Zion Association accepted Graham Baptist Church as a member of the association and then in March 1875, the church received its first baptized member, Robert A Noell. Until the congregation could gather under one roof, church history records have indicated it was necessary for the small congregation to meet for worship and hold conferences in the “the free school house”, Good Templars Hall, and homes of members. The vision of those eight dedicated Baptists to gather, worship and serve the Lord and its community were finally realized three years later on August 18, 1877. On that day, the historic bell hanging on the original white frame church building began to ring welcoming Rev. W T Farrow and its growing membership of 22 to worship. As was the custom of that time, ministers were shared among churches in the area, allowing the congregation of Graham Baptist Church to meet and worship the afternoon of the 1st Sabbath and the morning of the 3rd Sabbath each month. This thirty by fifty foot structure was not erected on the lot originally donated by the county commissioners, instead, it was located on a new plot of land consisting of one and two-third acre, known as Wyatt Outlaw lot, on North Main Street, Graham. As the membership increased, additions and modifications were made to the original while structure. 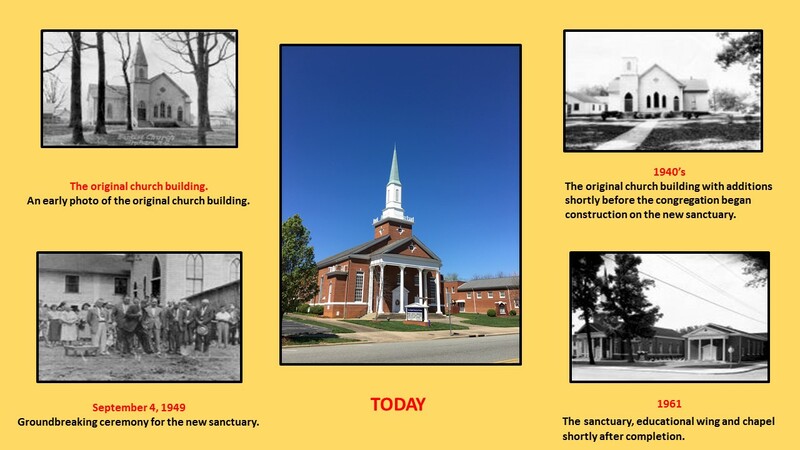 Over time, this no longer became feasible and in 1949 the congregation felt led to begin its ten-year journey to replace the original white structure with the present day brick colonial structure. 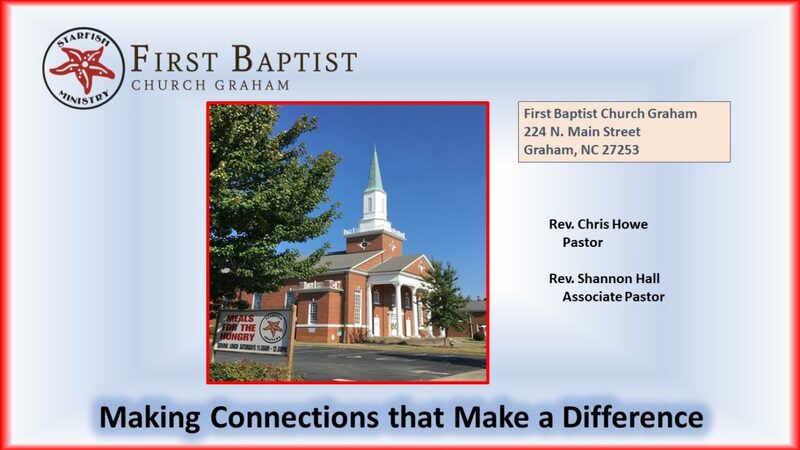 The congregation felt led to change its name from Graham Baptist Church to First Baptist Church, of Graham, October 11, 1942, to re-clarify the church’s identity as being the first church of the Baptist faith in the city of Graham and also to emphasize they were doctrinally and denominationally connected to the Baptist faith and to its community. As we all know change is inevitable. From 1874 to present day, First Baptist Church of Graham’s leadership has sought to effectively minister the gospel of Christ to a changing society. As this church has grown through the years, the churches membership, facilities, and services have tried to meet the spiritual and social needs of the community as well as, to develop the Christian commitment to meet these needs. No matter how much time passes, no matter what takes place in the interim, First Baptist Church of Graham’s history and commitment is to prepare its congregation in order to stand firm in its faith while serving God and its community. First Baptist Church of Graham decided to use the Starfish Ministry Logo for our church as it represents a significant ministry outreach program for the church. The Starfish Ministry is a church-supported ministry to our community through serving meals to those who are hungry. Volunteers from our congregation have formed 4 teams that serve a meal each Saturday for those who come to our Ministry Center as well as our homebound members and others as requested. Each Saturday from 11:30 to 12:30 throughout the year, teams serve everyone who comes, no questions asked. To see other pictures of our Starfish Ministry click here. Working together, we can make a difference. “Yesterday, Today, and Tomorrow”. First Baptist Church Graham has been serving the community for 145 years.